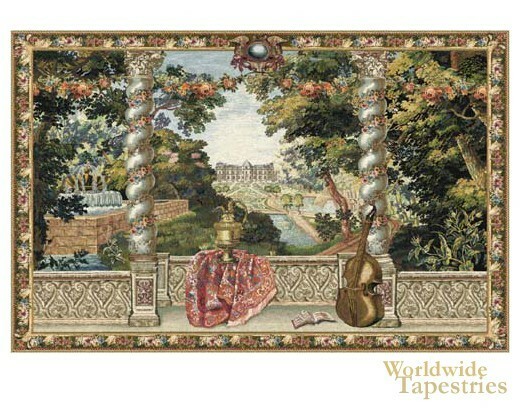 This tapestry "Domaine D'Enghien" shows a work based on the original Les Maisons Royales series of tapestries, the work of Charles Le Brun, director of the Manufacture de Gobelins, a team of artists which created art and decor for the palace of Versailles for King Louis XIV in the 17th century. Here we see a panorama of the gardens of Enghien, the property of which was sold by Henry IV of France to the d'Arenberg family in 1607. Here we see the ornate palace columns, pilasters, and balustrades decorated with flower garlands. The expansive gardens with its manicured trees, fountains and paths, are visible beyond, to the distance. In the foreground are a cello like instrument and an urn. A work of intricate detail that celebrates this favorite view of the gardens of Enghien. This cityscape tapestry "Chateau D'Enghien" is backed with a lining and has a tunnel for ease of hanging. Dimensions: W 74" x H 50"